Last Friday DC announced an upcoming anthology comic series featuring Firestorm! That’s right! Firestorm is back in comics… and being written by Gerry Conway! Legends of Tomorrow #1 (shipping in March) is an 80-page anthology comic featuring four different stories! Below you’ll find the cover to the issue by Aaron Lopresti! Click here for the official announcement! More details and discussion below the cover! Firestorm is back! To save Jason Rusch, Firestorm will need to retrieve Danton Black’s stolen research from Professor Stein’s lab. But if Jason can’t fuse with Ronnie by the Firestorm Protocol…who can? Legends of Tomorrow #1 will be on sale March 9th, 2016 with 80 pages for $7.99. While I’m thrilled Firestorm is returning to comics, I do feel a bit cheated. Back in July 2015, DC announced a new Firestorm six issue limited series written by Gerry Conway. So instead of Firestorm headlining his own limited series, he’s sharing with three other features. It’s an 80-page comic with four stories. Doing the math suggests each feature could get 20 pages to themselves. That’s equivalent of a stand alone comic, so at least we’ll get a full issue’s worth of Firestorm. Some folks have expressed concerns over the price tag of $7.99. Again, doing the math, that’s only $2 per feature. That’s a pretty good savings compared to stand alone comics (typically $3.99 nowadays). However, I’m not sure $7.99 is sustainable on a monthly basis. The big question is how many issues will feature Firestorm. Since we were originally promised a six issue limited series, will Firestorm be featured in the first six issues of the Legends of Tomorrow comic? Or will they shorten his story so it takes up less issues? The comic is called Legends of Tomorrow, clearly trying to capitalize on the TV series of the same name. 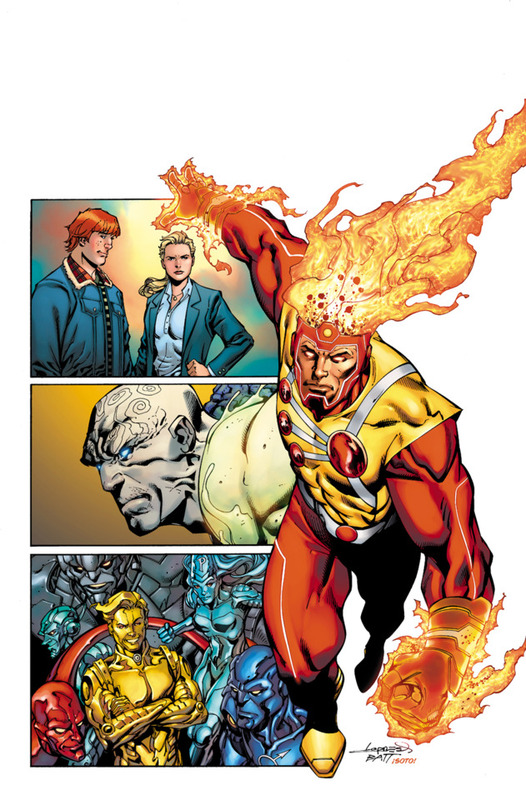 However, Firestorm is the only character to appear in both the TV series and the comic. Will other Legends TV characters appear in the comic? If so, how will that impact each feature’s run? Each of these features was originally promised a six issue mini-series. Who will get six issues of Legends to tell their story, and who will have less time? First and foremost, great news that Firestorm is back in comics and being written by Gerry Conway! Can’t wait! Second, we have questions. I sure hope DC provides some answers soon. Support Firestorm (and the Legends of Tomorrow comic)! Fan the flame! Posted in: Comic books, Firestorm #10: New 52 v2 (Ronnie/Jason), Gerry Conway, Jason Rusch, Legends of Tomorrow, Ronnie Raymond. IS THAT SUGAR & SPIKE!?! $8 a pop? That’s gonna hurt a bit. Otherwise in the book, Lopresti’s Metamorpho will at least look good. Never been the biggest of Metal Men fans and, although I dig Giffen, I’m not sure what to make of Sugar and Spike. I’ll give it a go, but the leash on this one is super-short, especially since it’s looking like the ONLY DC I’m going to get in March. My bad. I’ll still be getting Martian Manhunter. And where are the damn Hawks already?!? I’ll pay 8 samoleans to see The Professor and Ronnie back in action as the titular MatchHead. However, if it is some other form of the character, that price may be a bit much. Hopefully when they decide to collect this in trade each character will get their own book/collection, so maybe they can collect it as Legends of Tomorrow: Firestorm or something. Modern DC doing anything with Sugar & Spike scares the Beejeezus out of me. DC will give Bat-Hound his own comic, but not Firestorm. Bat-Hound has his own comic? Is that a sequel to Bat-Mite? I think you’re worrying too much, Shagg. Why wouldn’t the full six chapters go in there? And once potential readers realise they’re getting twice the comic for their cash, maybe they’ll give it a try. Hopefully DC are now prepping tales of the Hawks and Rip Hunter to go in there too. $8 is steep, even for a Firestorm book with a Lopresti Metamorpho.